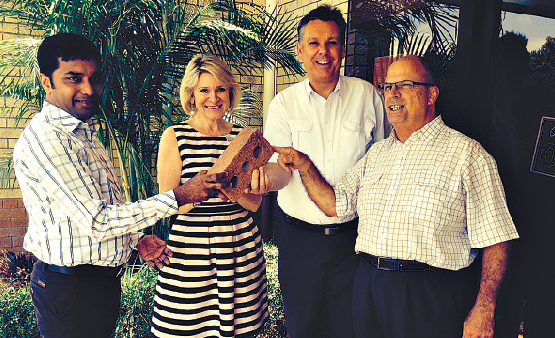 New foundations: Surfers Paradise parish Associate Pastor Fr Noyichan Mamoottil, parish secretary Lyn Borin, parish priest Fr Tim Harris and Fr Paul Taubman are asking for support for their ‘Buy a Brick’ campaign to build a new church in Broadbeach. AFTER years of prayers and planning, Surfers Paradise parish priest Fr Tim Harris has begun fundraising to build a new church on the existing land at Stella Maris Church, Broadbeach. Fundraising would be done through the parish’s campaign, ‘Buy a Brick’, which invites parishioners and other future benefactors to donate money towards the construction of the new church. Benefactors who donate money towards the construction will be on permanent display on a list in the new church precinct. Surfers Paradise’s first parish priest, Fr Neal Shannon, first used the campaign to fundraise enough money for the construction of a church and school. Many priests who have taken over Surfers Paradise parish since its establishment in 1946 have continued to renovate and upgrade the parish’s three churches. Fr Harris said Stella Maris was “looking old and tired”, was ridden with asbestos, and did not provide the right atmosphere for Catholic liturgies. More than $650,000 is needed to build a new the church in Broadbeach, which according to Fr Harris, was “beyond repair”. “We can improve the way we worship God,” Fr Harris said. “At present it doesn’t really provide us with the kind of opportunities for great liturgies, but a new church would. Fr Harris said he wanted the new church to reveal the beauty of the Catholic faith and take people out of the world and onto sacred ground. “It cannot just be a hall, this is a holy place,” he said. Fr Harris said the new building would not just be beneficial for the local Catholic community, but would benefit the entire Broadbeach community. “I believe we have a responsibility to invest in the future of this parish and provide for people who live in what is becoming the fastest growing area in Australia, Broadbeach,” Fr Harris said. During schoolies, Fr Harris received a phone call from a young man who asked for spiritual guidance regarding how to behave and act in one of the Gold Coast’s biggest teenage parties. He said he believed the phone call was not a one off and wanted to ensure that more people reached out to the Catholic Church for spiritual and practical support. “We want to be of service to the local community and tell them that Jesus matters because really, that’s who we represent,” he said. “To have a new church in the midst of an area where there are all sorts of issues, to be an alternative to the culture, that’s counter-cultural. “Our new Pope (Francis) has said we need to preach and be good news to the world. Fr Harris is now taking a “leap of faith” to raise the last lot of money for the new Stella Maris Church, but said God’s providence was already at work. Parishioner Justin King donated $500,000 towards the rebuild two years ago, and another benefactor has left the parish with a house and $400,000 with the land. “God is well and truly at work in the direction this is unfolding,” Fr Harris said.